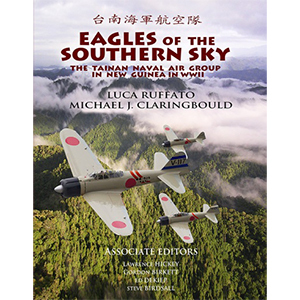 Eagles of the Southern Sky is a mammoth work researched and written by two WW2 authors, four contributing editors, and many consultants whose expertise is the Pacific air war. The authors are Luca Ruffato & Michael Claringbould, supported by the niche expertise of Steve Birdsall, Larry Hickey, Ed DeKiep, and Gordon Birkett. This book is unlike any others in its field. It is the first detailed English language history of a Japanese air unit. The research is first class, and supported by a vast amount of quality artwork: 2D aircraft profiles and 3D action shots. There are also many photos, most of them never published before. This book is a classic, runs to over 350 pages, and is full of detailed information never before published. Simply pick your superlatives and string them together for a description of this book! "Ground Breaking" is one that first comes to mind. Rather than describe the book in detail, check out the website www.tainanbooks.com. Avonmore Books is proud to be the sole Australian distributor for this book. The best way to purchase is via the e-commerce facility on this website, although limited numbers of copies will be available at selected retailers.